When Microsoft introduced several new products and updates on Wednesday, including the spectacular-looking Surface Studio desktop computer, it quickly became clear the company is gunning for Apple. Now, on the same day Apple is expected unveil long-overdue updates to its line of MacBook Pro notebooks, Microsoft is gunning hard for the iPhone-maker's customers with a new deal that'll give you hundreds of dollars to switch from a MacBook to its Surface Book or Surface Pro. 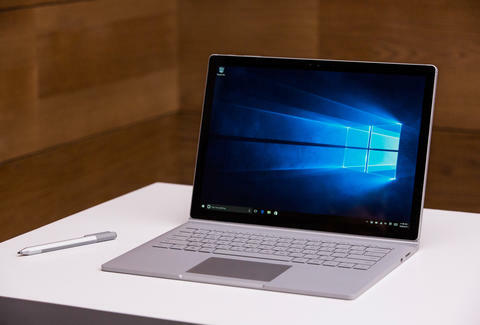 As explained in a report by CNET, Microsoft will pay you as much as $650 to say goodbye to your current MacBook Pro or MacBook Air and "trade up" to a new Surface Book or Surface Pro at a Microsoft Store or via Microsoft.com. Sure, that's probably not even half of what you paid for the sleek hunk of aluminum, but Microsoft hopes it'll put enough of a dent in the price of its own machines to make you want to jump ship in the event you're unimpressed by what Apple announces in Cupertino. Apple is widely expected to at the very least announce a new MacBook Pro with an OLED touchscreen above the keyboard instead of traditional function keys that's also equipped with the Touch ID sensor that's built into your iPhone's home button, among other big new updates. However, Brian Hall, a vice president of marketing at Microsoft, accused Apple of "doing customers a disservice" by not building notebook computers with touch screens, which Microsoft does with its lineup of computers, according to the report. To be fair, we won't know for sure if Apple's new computers lack touch screens until its event, but considering its previously stated stance on the matter, it's safe to say such a move would be extremely unlikely. It's also probably safe to say diehard Mac fans aren't about to subject themselves to using Windows 10, no matter how good a deal Microsoft offers on its computers. In any case, today would be a great day to not buy a new laptop -- at least until you've seen all the new stuff from the two companies. Tony Merevick is Cities News Editor at Thrillist and has two words for Microsoft: no thanks. Send news tips to news@thrillist.com and follow him on Twitter @tonymerevick.